On this particular weekend, Curtis had only half a day off, and that day happened to be rainy all over the island. It would have been easy to just forego our weekend adventure and enjoy a lazy day at home — but we both knew that we needed to do something. 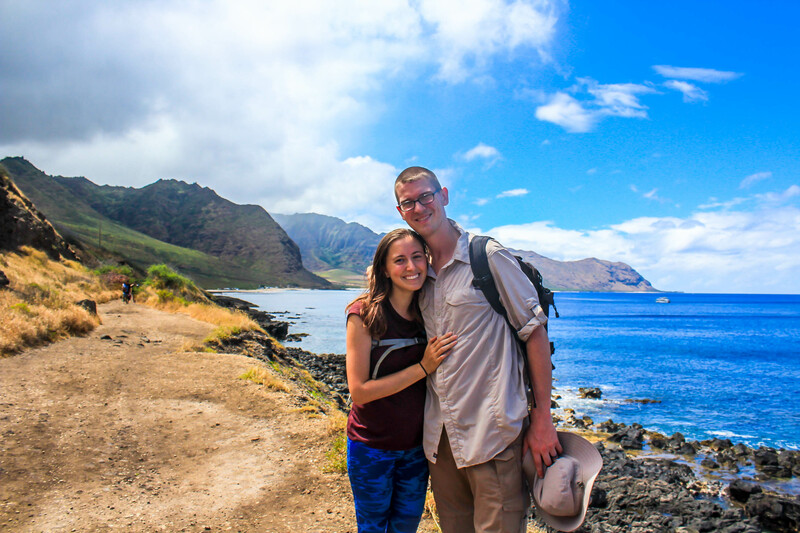 Getting out and exploring the island together is what keeps us inspired and excited about life. We need that reminder that life is more than a stressful job and the daily routine. We need to see and experience new sides to this island to remember how beautiful it is and what a privilege it is to live here. After a long week of 7 consecutive 13+ hour work days and having all our hopes and dreams of a summer vacation crushed, we needed a day like this to remind ourselves who we are and what we love. I’m not saying this to draw sympathy or complain, this is just our reality and it’s important that we remember these more challenging days. We love reading back on this blog at previous weekend adventures, and reminiscing the “good old days.” The days when a weekend meant 2 full days off, when we could spontaneously travel with ease on a budget, and when we lived somewhere that we truly loved. It’s easy to miss those days, but I know that we’re in this time for a reason, and we’re growing and learning new things from it. I can’t wait to look back on this time in the future and see the whole picture of how this chapter fits into our story. Ok, back to this weekend — I drove to Pearl Harbor to pick Curtis up, and from where we were in the center of the island, we could see low hanging rain clouds over both the Ko’olaus and Wai’anaes with a heavy rainstorm in between. I had been planning a hike on the Leeward coast, but we didn’t want to drive an hour there if we were just going to be rained out. 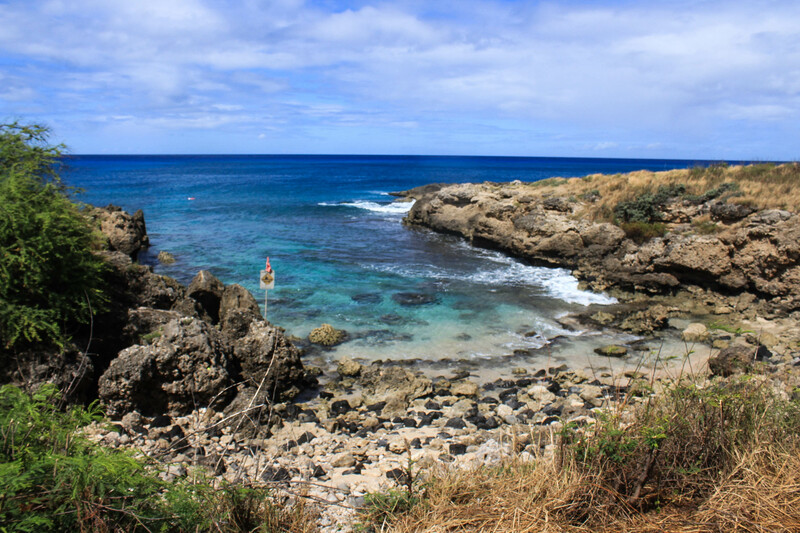 We talked about what was over there that we could do, and ultimately decided to drive all the way to the end of the coastal drive and hike the easy Ka’ena Point trail. We had done this a couple times from the North shore, but never started the trail from the West so it still felt like a new adventure. Also, up until this day we had only driven as far as Wai’anae when we hiked Ka’ala last fall. And so we began the long drive to the Leeward coast on H1. The biggest reason why we don’t visit this coast very often is because it’s so far from where we live, however I have to admit that I don’t often want to drive out there because of built up prejudices from things I’ve heard. I feel like I hear about more theft and break ins on the West side, as well as crimes targeting non-Hawaiians. But as we drove up the coast, I wished more than anything that these factors didn’t exist. There’s a couple towns after leaving H1, but beyond the towns is a vast space between the populated area and the mountains that appears untouched. On the Windward (East) side, the dramatic Ko’olau cliffs are so much closer to the highway and the space between is mostly taken up by towns and residential areas, but here it seems so much more spacious. 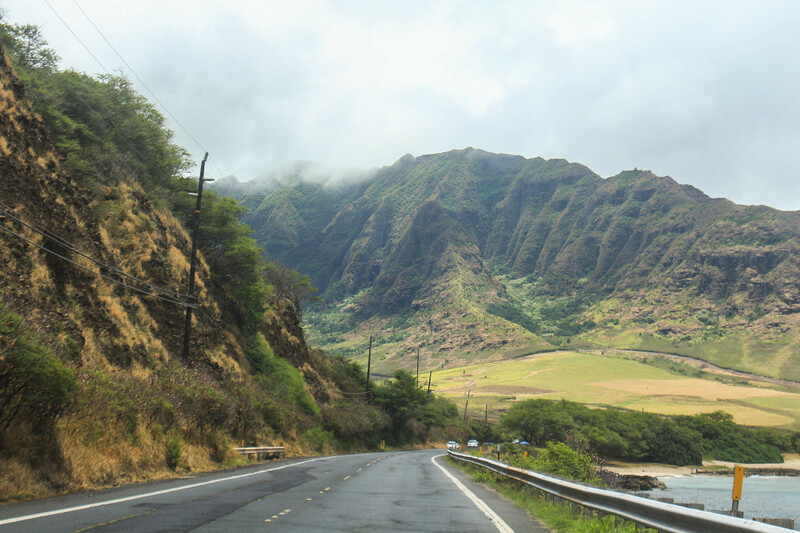 Unlike on the South side of the island, where neighborhoods exist all the way up the ridges of the Ko’olaus, the mountains are mostly untouched, standing high above the land below. The scenery also is drier, with yellow hues rather than lush green, which takes my mind back to the American Southwest. But outside of Wai’anae, I was brought back to reality as we continued the Leeward coast drive. There were run down homes and homeless camps along the road, and I felt more uncomfortable, but was bothered by my mindset. I know crime happens all around the island, and there is really no true safe place on this earth. Still, the only time when we encountered a broken-in car was at a trailhead outside of Wai’anae. We always remove valuables and leave nothing in sight, but it’s just an inconvenience that we obviously don’t want to have to deal with. 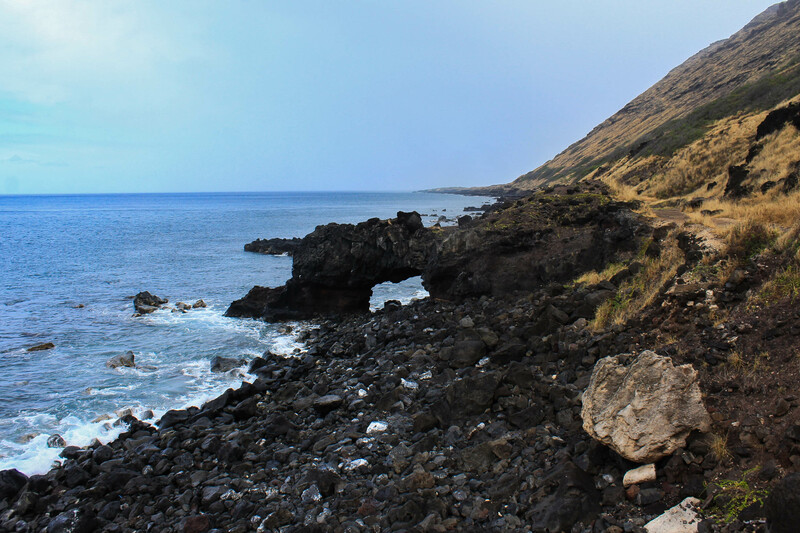 The 2 hikes I had heard of that appealed to me today were Ka’ena Point, and the Upper Makua Cave. We drove past the lower cave and what was supposedly the trailhead for the upper cave…but immediately noticed two things: one, this wasn’t a place we wanted to park our car, and two, there wasn’t an official trailhead — instead, there were signs saying “No Trespassing, Government Property.” There must be some mistake — we decided to just continue driving to the end of the road and reevaluate later. The Leeward coast highway ends at Ka’ena Point State Park, which was fairly busy today, but a popular parking area and trailhead put our minds a little at ease. Also, it was still much less busy than the East side would be! We first walked out to the coast to take in the view. It was honestly perfect — while the parking lot had plenty of cars lined up, we couldn’t see any people, and from this point you can’t see any towns or homes. This far North, the mountains come out to meet the sea, and I couldn’t get enough of the view. The majority of my pictures from this day are the view to the South. 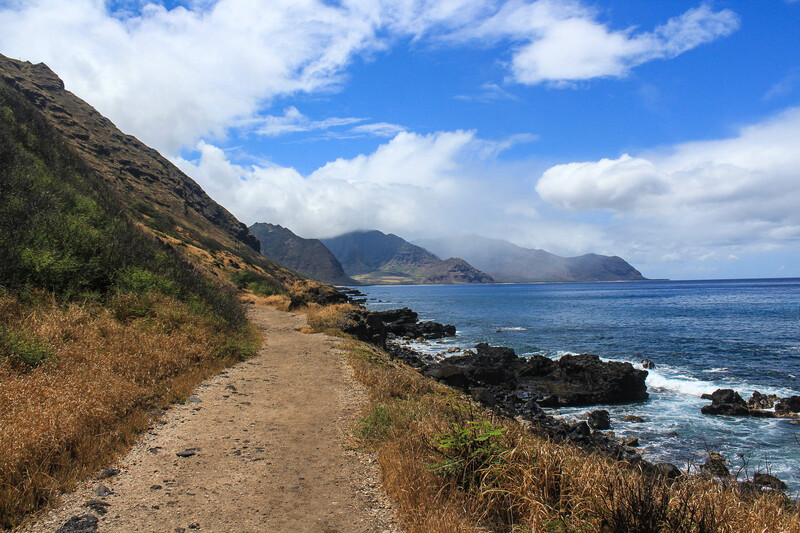 We finally began on the Ka’ena Point trail. It was comparable to the trail on the North shore, being mostly flat and an enjoyable walk with hills in one direction and the ocean in the other. The path is a bit more narrow and probably less frequented by off road vehicles, but we still saw some from people fishing along the coast. 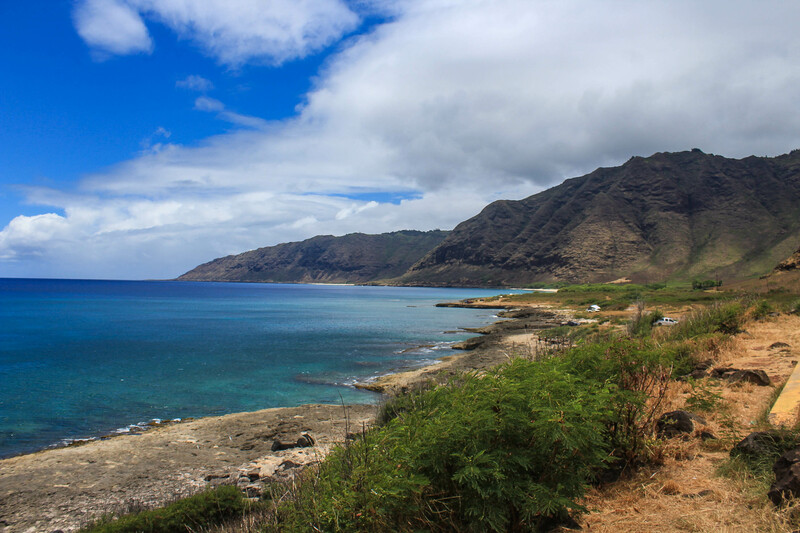 You can’t go wrong with either side if you’re trying to decide whether to approach from the North shore or the Leeward coast, it just depends on where you feel most comfortable driving to and parking. The waves on the North shore are louder and larger, I personally loved the view to the South on the Leeward coast the most — but you can still see it from the point if you hike along the North shore. I’m glad we decided to try it both ways, and wouldn’t mind returning to hike it again. It’s just an easy and safe hike even if the weather isn’t great. Speaking of which, it did rain on us off and on, but we came prepared with an umbrella and pressed on. The clouds and rain showers obstructed our views so we could barely make out the mountains. All that we could see was the trail around us and the rocky coast to our left. We pretended that we were walking along the Oregon coast, and it made us happy. Altogether, we hiked 4 ½ miles out and back, though we didn’t walk through the protected grounds at the point itself (we did that the first time we hiked to the point). We returned to our car, finding a letterbox on our way back and meeting our “one box per month” quota. Not that we’re restricting ourselves to one box…we attempt plenty, but only find an average of one a month. 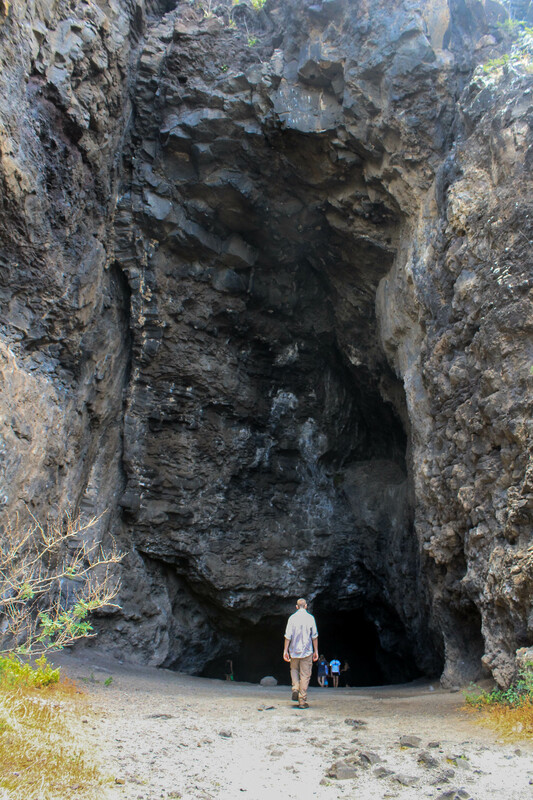 We began our drive back, this time stopping to check out the Makua caves. The first one is right off the Leeward coast highway and easy to find — we just parked right across the street and walked right in. It doesn’t go back very far, not even necessitating a flashlight really, but still cool nonetheless. We then went to investigate the Upper Makua Cave trail behind a group of hikers that were hiking there, and found that it really did begin behind a “No Trespassing” sign. From what I’ve read about the trail, it’s obviously not official or signed, just a steep scramble up a cliff with loose rocks to a cave smaller than the lower one, but with nice views to the North. But we know better than to trespass on government land, so we turned back for today. That’s the most annoying thing about Hawaiian hikes — I can read about them online and they sound cool and like legitimate hikes, but half the time they’re either illegal or not official trails. If a trail becomes washed out or has too many rescues, the state’s great idea is to make it illegal rather than solve the problem, and simply finding a trail to be illegal hardly stops anyone. I know, we rant about this too much, I honestly wish I could go back to the mainland and revisit areas we used to hike in just to compare and see if the difference is really as drastic as it is in my mind. Anyway, all that aside, we had a great time and still got a few hours of being lazy together at home, AND were a little productive as well. Whenever we drive home from the West coast, I always wonder to myself if this will be the last time we visit. The Leeward coast holds so much unique beauty compared to the other sides of the island, and is less busy as well, but there’s just not as much that we want to do over there. That being said, we have had 3 great visits to the Leeward coast in our 9 months on the island, so maybe we’ll find our way back there someday!